Our Harrogate Hog Roast Caterers service provides the very best free range local Harrogate Hog Roast catering for any type of event. Whether you are planning an event that needs catering in Harrogate or looking for a great outdoor caterer for a Wedding, Birthday or Street Party then we can help. Our Hog Roast chefs and serving team only ever use the very best quality local and ethically reared meat. All prepared with care by hand and cooked by our Yorkshire family-run caterers. The Harrogate Hog Roast caterers team pride themselves on serving the very best Hog Roasts and BBQ possible. Using fresh ingredients local to Harrogate ensures our Yorkshire caterers can prepare the leanest and most tender meat. The quality speaks for itself and our Hog Roasts are award winning, being sourced from well-cared for animals. Even though we serve local Harrogate Hog Roasts, we have also won many national awards for our food and service. No matter how many guests you'd like to feed, a Hog Roast provides a means for a wholesome hot and tasty meal which will always be within your budget. We've served at numerous Harrogate catering events over the years and we know that a Hog Roast is always really well received. Surprising your guests with inventive yet mouthwatering smells and flavours. What a fantastic centre-piece to any event, a Harrogate Hog Roast will attract a large crowd of spectators with its delicious smoked aromas. Best of all things are kept simple, with great meat in a bap or bun topped with our homemade dips and sauces - we even make our very own coleslaws and side dishes from scratch. Ever popular, the Harrogate Hog Roast is always in demand! Our outside event Hog Roast Caterers are serving at Weddings, family gatherings, events and parties on a daily basis. The versatile Hog Roast lends itself to every type of catering situation and is a fantastic choice for indoor or outdoor catering. Harrogate's long history and deep-rooted traditions seem to suit the Hog Roast perfectly, with a rustic wholesome Hog suiting Harrogate's beautiful scenery and surroundings. Businesses in Harrogate have also made the Hog Roast their go-to catering option for any type of event including corporate showcases, away days, product launches and parties. Wedding catering too is a very popular Hog Roast and BBQ choice, but we do also cater during festivals and seasonal events such as Bonfire Night, Halloween, Christmas and Harrogate New Year's parties! It doesn't matter what time of year it is... It doesn't matter how many people you require catering for, or even the size of the event - hire a Harrogate Hog Roast if you wish to please the crowd and make your catering event a real success. Our Wedding Hog Roasts Harrogate menus are extremely popular. With our Hog Roast caterers currently serving at over 150 weddings in and around Harrogate each year, we certainly have the experience to help make your big day a real success. Every time our catering team serve at a Harrogate Wedding they get an overwhelmingly positive reaction. The Hog Roast really draws a crowd of hungry spectators and helps provide a really warm and friendly atmosphere. The taste too is divine, due to our chefs only ever using award-winning free range produce couple with the freshest local ingredients. We make all our own sauces, dips and rubs as well as sides and coleslaw etc. This is the perfect BBQ food and we are experts at preparing and cooking it to perfection. Our Harrogate Hog Roast Wedding caterers can also change and tweak any dishes or menu packages to suit your requirements. Please contact us now for a free Wedding catering quote. 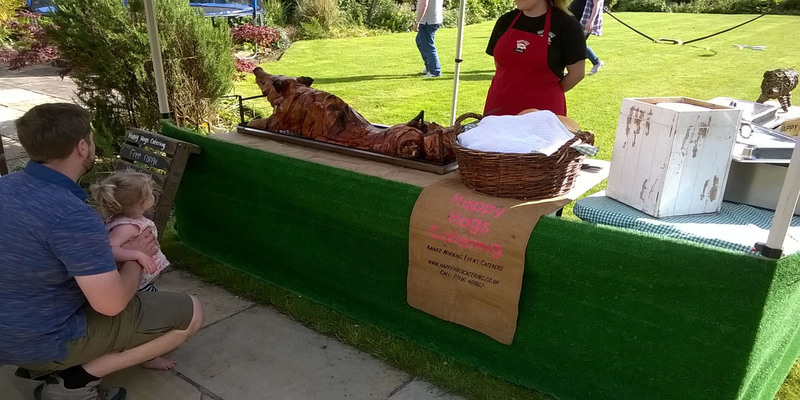 Why Choose Hog Roast Catering in Harrogate? We realise it may sound strange, but a Hog Roast should not be overlooked when thingking about the type of catering for your event or special occasion. A Hog Roast is a wholesome hot meal for your guests that can be enjoyed while standing or seated, in a formal or casual setting - and best of all, it can be served absolutely anywhere! Our Harrogate Hog Roast catering service is completely mobile for both indoor or outdoor catering. So we have some real BBQ advantages to Hog Roast catering, and that's before we've even mentioned the beautiful mouth-watering taste! There is no escaping it, one of our Harrogate Hog Roasts will leave your guests both completely satisfied and yet wanting more... The flavour is to die for, and our Hog Roast will be some of the best catering food your guests will have ever tasted. What a fabulous way for those attending to look back on and remember your event. Harrogate Hog Roast Catering are pleased to have now won ‘The North of England’s Wedding Awards’ in the caterers category, going up against Exclusive Caterers Dine from Sarah Beeny’s wedding venue Rise Hall and Michelin star dining from Box Tree Catering previously owned by James Martin celebrity TV chef and many other event caterers, wedding caterers and Yorkshire caterers.